It's not a story I used to think about much, if I'm being honest. It's not what I would call a childhood favorite, not a story that I held close to my heart or that revolutionized me when I was young. When I read it as a kid, it actually made me pretty uncomfortable. I didn't like it, found it unsettling. The idea that my toys might depend on me for their very existence? Creepy. I sort of mentally shoved it in with The Brave Little Toaster* and other stories I didn't quite get and moved on. As an adult, however, I've come to really appreciate The Velveteen Rabbit. It's not much of a story, sure, more of a sketch, but it has this power in it. This grab-your-guts truth to the narrative that makes me want to read it over and over again. So, I suppose, major props to the writer, Margery Williams, for creating a story that has such deep emotional resonance, especially with so little material. Because, like I said above, The Velveteen Rabbit is a story that says a lot by saying very little. The main plot is incredibly simple. 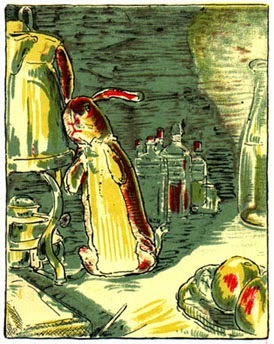 The Velveteen Rabbit is a stuffed toy given to a small child for Christmas. 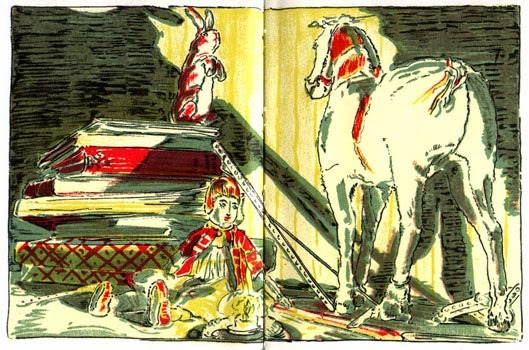 The Rabbit - which has no other name - is at first very uncomfortable with himself, feeling inferior to the other toys, but with the help of another older, wiser toy, called the Skin Horse, he comes to accept who he is. The Boy soon becomes very attached to this Rabbit and they play together a lot. The Rabbit becomes, in a way, Real to the Boy, which is the best thing a toy can hope for. And then the Boy falls sick with scarlet fever. The Rabbit stays with the boy and comforts him while he's sick, but when the Boy recovers, the doctor declares that all of his old toys and blankets must be burned so that the infection can't come back. 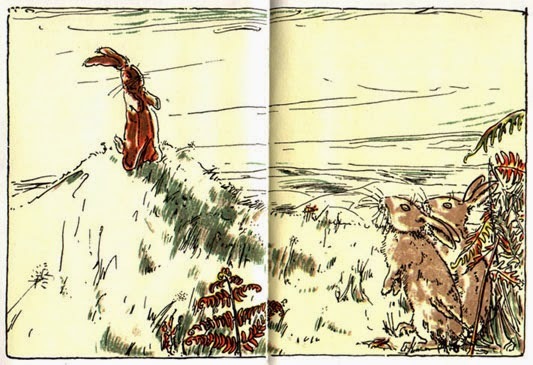 ** The Rabbit is one of the toys who must be burned, and he mourns this even though he's so glad the Boy is better. But. While the Rabbit is waiting in a field to be burned, he's visited by a fairy, the fairy of nursery magic. And she tells him that she can give him a gift. She can give him the gift of becoming Real, not just to the Boy but to everyone. Then she does. 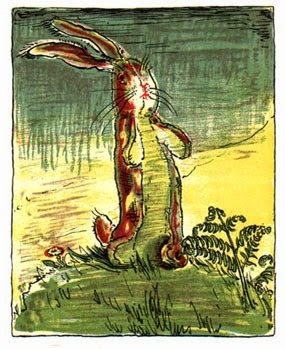 She does her magic and the Velveteen Rabbit becomes a Real Rabbit and dances and skips and plays with the other rabbits. The end. See? It's a very simple, very straightforward sort of story, and you'd be well forgiven for not thinking there was a bigger hidden meaning behind it. I mean, this is definitely the story that made me paranoid about throwing away my stuffed animals, and I think it must have been an inspiration behind Toy Story, but there's not a whole lot else going on there. Right? Hahaha, no! Of course there's more going on here! There's always more going on. So, I really don't know if Margery Williams intended for her story to work perfectly as an analogy about the human condition. I can't ask her because she's dead, and she's not from a generation where they were particularly apt to explain themselves at length. In other words, this is all my interpretation of the story. Take it as you will. 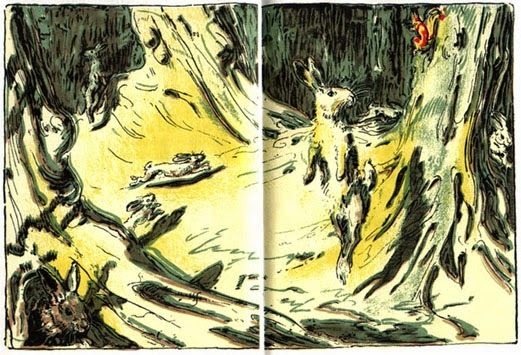 To me, though, The Velveteen Rabbit isn't just a story about how much toys can mean to a child, it's actually a very poignant look at humanity and what makes us who we are. The Rabbit's interest in becoming Real and his subsequent journey is basically the journey that we as people go on. We all start out not really real. We start out all new and fresh and a little bit empty. But as we invest in people, care for them, and accept their care in return, we become Real. And the story really shows that. I don't know of many more perfect explanations of how it feels to care about the people around you. Real isn't something that comes all at once, but it's bit by bit. The more we share ourselves with each other, the more real we become. The more we open ourselves to love and to the truth of who we are, the more we are capable of. It had to have been two years ago now, maybe more, but I was having a conversation with a friend about how I felt sometimes like when I invested in relationships with other people I was giving away parts of me that I couldn't get back. That I was somehow diminished by giving myself away to these people. My friend, who is fantastic and very wise, countered with her theory. Instead of being diminished, she said, I was being increased. Because when you give in love to others, you don't lose that love from yourself. As long as you really know who you are and where you came from in God, you cannot be made lesser. Rather, the more you love the more you are known. And the more you are known, the more you can be said to be real. It was like the light came on and I could finally see what was going on. Because, as far as I can tell, that's true. I'm not talking about bad relationships here. Not abusive relationships or toxic relationships or hurtful places and people. But when you invest in someone in love, when you care for them, you become real to them in a way you weren't before, and they become real to you. I especially love that bit above where the Skin Horse talks about how being Real involves getting the fur rubbed off in places and looking shabby and maybe seeming a little ugly. Because isn't that true as well? The more we are loved, the less we care about our bald patches and our cellulite and our bad teeth. We become more beautiful to the people who actually matter. I know this is all very far up in the air and not super practical. That's okay. The idea that we are not yet Real when we are born and we become Real the more we are known and choose to know others doesn't necessarily have to change your life. You might not agree or you might not care. But I care. It changed my life. It made my life infinitely better to think about this. So I'm sharing it with you because I would feel selfish not to. Because it's okay to admit that we all long to be known and to be loved. There is no shame in that. There is only hope. Because if you long to be known and loved, I can guarantee that the other people in your life want that too. Both for you and for them. So go for it. Become Real. It might hurt, and it will be hard, but like the Skin Horse says, when you're Real, you don't mind so much. **Which is actually a pretty solid solution when you don't have bleach or other anti-bacterial solutions lying around.